On Thursday October 18th 4pm St. Boniface Brewing will be releasing our coffee brown ale for the first time in 16oz cans! 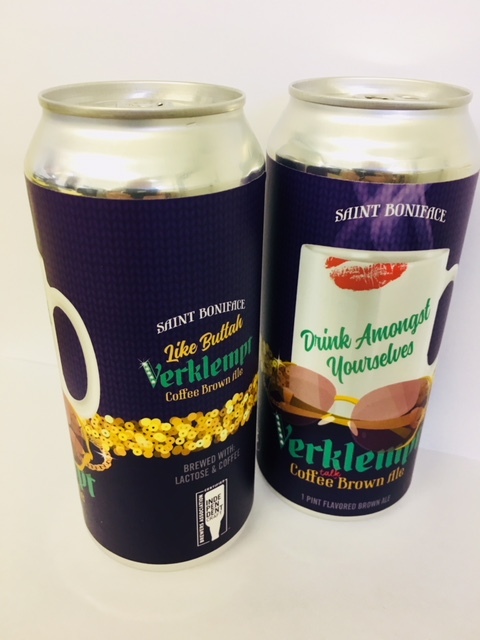 Verklempt – Coffee Brown Ale is brewed with a healthy dose of brown and crystal malts, flaked oats enhance the rich malty flavor and gives body to this beer. Sweetened with lactose, the cold brewed dark roast coffee from SquareOne roasters completes this offering making it a perfect marriage of coffee and beer! Since 2010, we have been brewing and serving beer in a town called Ephrata, Pennsylvania. We believe a more enjoyable drinking experience awaits the masses, so we seek to carry on the spirit of Boniface by laying the axe at the root of the tree of bland beer. Our brewery guests enjoy year-round, seasonal and limited edition beers crafted and served on site. We offer a small menu of pizza, calzones, and sandwiches and live entertainment to complement your visit. Join us at the St Boniface Craft Brewing Co. for drafts or growler fills, and find our beer on tap in and around Lancaster County. Company: Saint Boniface Craft Brewing Co.